The Wisconsin Historical Society owns over 200 original and reproduction bird's-eye-view maps of Wisconsin cities and villages dating from the 1860s to the early 1900s. Bird's-eye-view maps are drawings that portray cities and towns as if viewed from above. They have a distorted, yet charming, perspective that combined concrete reality with an imaginary high-in-the-sky perspective. A small settlement may be represented in only one small, simply colored map. While a large city may be represented in several, more elaborate maps. 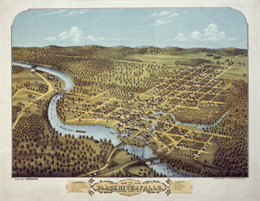 Bird's-eye-view maps are valuable resources for local history and architectural research, as well as providing a uniquely American vision of the urban landscape. Most bird's-eye-view maps are available for viewing online. Search by keyword, geographic location or date. View online bird's-eye maps in the Society's collections. Bird's-eye-view maps are located in the Archives. They are arranged alphabetically by city, then chronologically. Bird's-eye-view maps were popular from the 1860s until the introduction of aerial photography around 1920. Developments in printing technology along with the growth and prosperity of settlements in the post-Civil War era created a ready market for these city portraits. An artist would visit a city or village and walk its streets while sketching its buildings. Then, the sketches were assembled into a drawing of the city as it might appear from the air. Thus, the term "bird's-eye view." Although not generally drawn to scale, they show street patterns, individual buildings, and major landscape features in perspective. Local residents expected their city or village to be presented as thriving and prosperous. Artists would add details such as smoke streaming from factory chimneys, ships sailing the rivers or harbors, and railroad engines busily hauling freight. The maps were also expected to be accurate. Street names had to be correct and buildings meticulously represented. Details were important, down to the number of doors and windows, and their placement, in individual homes. The aerial viewpoint allowed the view to show the entire city - at the expense of a certain distortion of perspective. Frequently the view would include small pictures of individual buildings. Or, important sites would be numbered and keyed to a list of references printed at the bottom of the view. Once completed by the artist, the view was printed and sold to local residents who took pride in the depiction of their home city in all its individuality. For municipalities and businesses, the views provided a popular and positive way to promote themselves. Digital maps on the Wisconsin Historical Society website may be printed or downloaded at no cost for nonprofit educational use by teachers and students, or for private use by individual researchers. Nothing may be reproduced in any format for commercial purposes without prior permission from the Wisconsin Historical Society.